The Snowman Triathlon: Entries for the legendary race are NOW OPEN! | News by Wales Express News, People Before Profit! Home Entertainment Hobby The Snowman Triathlon: Entries for the legendary race are NOW OPEN! Entries for the stunning Snowman Triathlon powered by Suunto are now open, and the infamous Moel Siabod run route is set to make a welcome return to the event. The Snowman, which will take place on the 29th and 30th July 2017, is a real highlight in the race calendar for everyone who has experienced it and features everything that makes an Always Aim High event one of the unmissable races of the season. The triathlon begins with an open water swim in the gorgeous Llynnau Mymbyr, under the watchful gaze of the Snowdon horseshoe. The cycle takes competitors across the length and breadth of the Snowdonia National Park and includes such iconic stretches as the Pen y Pass hill climb. Rounding off the race is the infamous run. Legend and Full distance competitors will get the chance to take on the infamous Moel Siabod trail/fell route which makes a welcome return for 2017, while Sprint competitors will complete a challenging but flatter and equally beautiful trail run which featured in last years Snowdonia Triathlon Festival. Snowman Savage competitors will be the only athletes able to complete both unique runs over the course of the weekend. The Snowman Triathlon 2017 will also feature a completely new race: the Snowman Swim. Choose between a half and full mile swim laps in the glorious Llyn Mymbyr at Plas y Brenin! 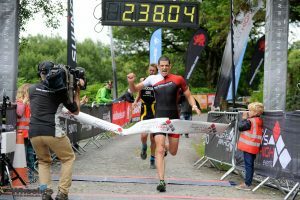 A great entry point into one of the world’s most beautiful triathlons, the Sprint includes last year’s popular Snowdonia Triathlon Festival trail run route (so no Moel Siabod). A unique chance to experience an incredible open water swim race in Llyn Mymbyr. Located at Llynnau Mymbyr, with the stunning backdrop of the Snowdon horseshoe, this junior specific event has routes of varying length, for children ages from 8 to 16 years. The Snowman Full distance includes all the exciting cycling and running routes that have come to be expected of the legendary Snowman, including the Moel Siabod fell/trail section! After a hugely positive debut at the Snowdonia Triathlon Festival in 2016, the Legend (half iron) distance returns with the same incredible cycle, but with Moel Siabod rounding off the already challenging trail run. Returning for 2017 is the hugely popular Snowman Savage. This weekend long event combines the Sprint and Full distance courses, meaning Savage competitors will be an exclusive group of people that get to experience both very different run routes! The Snowman Triathlon is the second race in the Always Aim High Events Adventure Triathlon Series. The series also includes the legendary Slateman Triathlon and the Sandman Triathlon. Competitors can compete in any distance of all three, and the winners of the series will be announced on the Sandman weekend in September. Entries for the Snowman Triathlon powered by Suunto are now open. For more information, visit snowmantri.com.